Ronald Reagan is thought of as a Californian, a westerner, but the values that guided him all his life are straight out of the American heartland where he was born and spent the first twenty-one years of his life: northwestern Illinois. He was the product of four generations of rural settlers. The characteristics associated with him--self-reliance, self-confidence, modesty, optimism, loyalty, tolerance, determination, good humor, and reverence for God--all came from his teachers, clergy, role models, the circumstances of his youth, and especially his parents. Through the experiences, challenges, and adventures of his childhood, youth, and young adulthood, Reagan's Roots traces the development of all these elements of his character so that the reader will come away with a better understanding of what made this man a successful and beloved president. 15 historic and 3 modern photographs. Three appendixes: Visiting Reagan's Illinois; Reagan at Eureka College; and Going Home: Reagan's Later Visits. Index. Peter Hannaford has had a long career in American politics and public affairs. He is a former Reagan adviser and current senior consultant to APCO Worldwide, a public affairs/strategic communications firm based in Washington DC. In Mr. Reagan's 1976 presidential nomination campaign, Mr. Hannaford was Director of Issues and Research; in the 1980 campaign, he was Senior Communications Advisor to Mr. Reagan. He also served as Assistant to the Governor and Director of Public Affairs for then-Governor Reagan in Sacramento. He is the author of eleven books and numerous articles, columns, and essays. "No one knows more about the history of Ronald Reagan than Peter Hannaford, and he has translated that knowledge into a fascinating book about the origins of our fortieth president. Ronald Reagan's success as a leader was based on the values and habits that he learned as a child and young man. 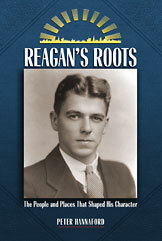 Reagan's Roots explains how the foundation was laid for an outstanding life of patriotism and public service." "As one of Ronald Reagan's favorite speechwriters and one of Ron and Nancy Reagan's favorite people, Peter Hannaford has a perspective and knowledge about this event-making man that few others possess. "With his newest book about the Gipper, Reagan's Roots, Peter proves that the body of Reagan scholarship is just being opened up on this utterly and endlessly fascinating man." "A lively, fast-moving account of Reagan's formative years, with many new insights and stories about the places where Reagan grew up, the choices he made, and the talents he honed that took him from northern Illinois to the presidency."